Missouri is another step closer to becoming a so-called Right to Work state. The state House has passed a measure, which would bar mandatory union fees in workplaces. Passing such a law has been at the top of the Republicans’ wish list for years. 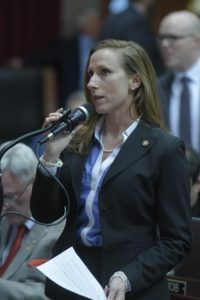 During Governor Greitens’ State of the State address on Tuesday, he called on the General Assembly to make a Right to Work law a reality in Missouri. Bill sponsor Holly Rehder (R-Sikeston) says states with Right to Work laws have experienced growth in jobs and their economies. “The U.S. Bureau of Economic Analysis reported that from 2004 to 2014, all top five states in private sector employment growth were Right to Work states. Currently, 27 states now have passed Right to Work. No state that has passed Right to Work has backed up and said this isn’t working. The movement we have seen has only been other states adopting this same policy,” says Rehder. Rep. Clem Smith (D-Velda Village Hills) says the measure would lead to lower wages and affect benefits. The proposal now heads to the Senate, where Democrats are expected to stall a vote on the bill.